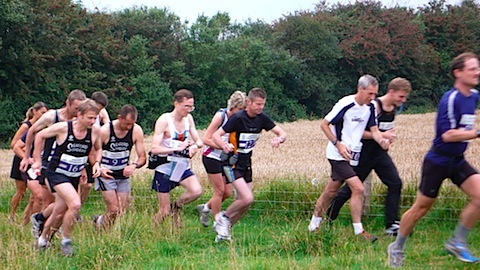 I ran the only race I'm taking part in during my training for Beachy Head, the Firle 20K. starting and finishing in the ground of Firle Place, the race ran along the Old Coach Road at the foot of the downs, passing Charleston and Berwick, before a stiff ascent onto the Downs, and then followed paths I know well, the length of the Firle Beacons escarpment, as far as the dew point and trig point on Itford Hill, then returning by way of Firle Bostal. So far I only have my unofficial time, 2:06:52. I had hoped to finish in under two hours, but I don't think I disgraced myself. I've never run the distance before, so this represents a personal best. No other running this week, other than a five miler on Friday. On a hot Saturday afternoon I ran twenty miles, from Seaford to Saltdean, along the cliff-tops. It's a route I have often used for long runs, and I managed it well, without the exhaustion at the end of my 18-miler. It's not as hilly as some routes, with just under 2000ft of ascent. A dull evening, and dark clouds out to sea. I ran four fast miles to the end of Newhaven East pier, where some anglers were photographing each other and their catch.I startled two dog walkers, though I always think I run noisily, particularly over shingle. There was a small ship of indeterminate type painted in naval grey in the bay, though it had gone this morning. I rarely have the chance to train away from Seaford, but on Friday the opportunity came to run from Ditchling Beacon to Blackcap, on the way back from some errands in Brighton. The Forerunner's battery gave out, so I have no data, but estimate it to be around six miles. The last time I ran this way was when I worked at Sussex University, in thick fog, and I got a little lost. This time the weather was fine and sunny, with splendid views down to Ditchling and Plumpton, across the downs to Brighton and east to Seaford Head. On Sunday I cut the long run back to fifteen miles after last weekend's painful eighteen, a tactic that seemed to work, for I was still strong at the finish. I went on a there-and-back route, by way of Bo Peep, Firle Beacon and Beddingham Hill. At Bo Peep there were more paragliders than I have ever seen at once. This run offered 1763 feet of ascents, rather kinder than last week's 2662ft. I used the lap function to compare the outward and return journeys, but found no significant difference. I ran eight fast half-miles on Seaford front, with very short recoveries of 100 yards, and, as usual for an evening run, curtailed warm-up and cool-downs. It was a beautiful evening, with a red sun setting over the sea. A curious thing happened, though, my vision became blurred, almost as if I was about to have a migraine, which I haven't had for twenty years. My reasoning ran thus: Saturday was forecast to be windy and dry, Sunday to be windy and wet. Saturday was therefore the day for an eighteen-mile long run. In fact, though the first half was dry, though very windy, at around nine miles heavy rain started. I went to Bo Peep, then down to Alfriston and Litlington, then into Friston Forest and back by way of Seaford Head. The surfaces were slippery and muddy, and I found the going very tough. The ascents, according to the Forerunner, totalled 2662ft. Again I had trouble with the Garmin, so on a windy Wednesday evening, an attempt at some 400m fast runs didn't go to plan. Then today I ran three miles, taking advantage of this to run a route that allowed me to check the distance from my current home to the station, and the equivalent journey to what I hope will be the new one. I offered my services as a marshal to yesterday's Seaford Marathon. This is the first time I have done anything like this since a wet and cold sports afternoon at school when, excused games for some reason, possibly either when I had a periossial haematoma on my forearm caused by a hockey ball, or when recovering from a head injury when a rugby scrum collapsed, I was sent to stand in a muddy field by the railway line in the fields outside Cambridge to direct cross-country runners. 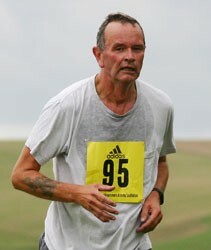 I stood at the hamlet of Norton, at roughly the 21 mile point on the hilly course, directing runners up a hill. The weather was mostly kind and I was joined for a while by some spectators, a small girl, her mother and an older man, grandfather of small girl, I would imagine, there to cheer on a runner who had chosen Seaford for his first marathon. The first runners through were going at a strong pace, though I was sorry to learn that further on, with only a mile or so to go, they took a wrong turn at Fiveways and lost the lead. More followed, over a period of about two and a half hours, some visibly exhausted, some cheerful.